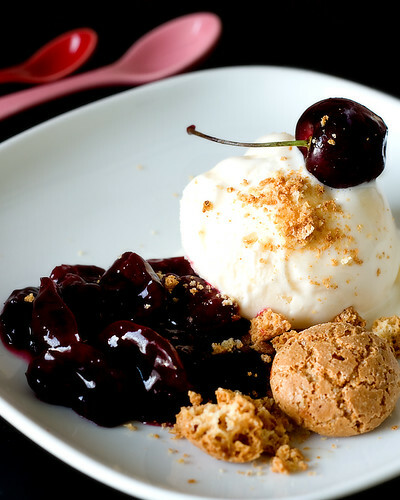 Spiced cherry sauce has been in my bookmarks ever since I saw it at Bloodsugar, Graeme’s gorgeous blog. Captured beautifully through his lens, the recipe is quite tempting, that I tried it first thing this Summer, with two variations. 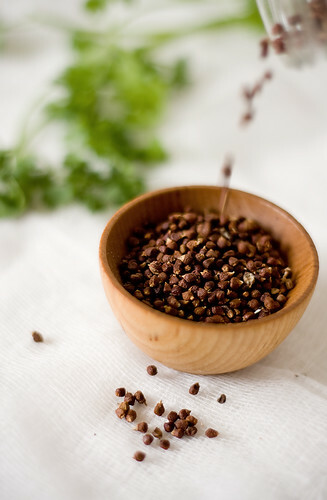 Recently, I have been hooked on to Grains of paradise, a West African spice that has a mild peppery flavour. To me it tastes toasty with ginger and cardamom undertones. I grind some on top of pulao, raita, fruits and even ice cream. And my fondness towards it only seems to grow. In this recipe, I substituted black pepper with grains of paradise. I also made the sauce in microwave oven in under 4 minutes. For a quick sauce like this, it was very tasty. Thank you Graeme, we really liked it. Note: Microwave times may vary depending on the appliance. 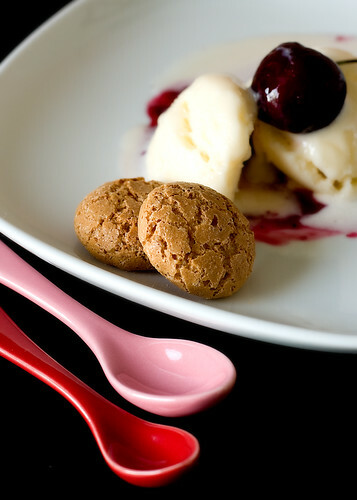 Take cherries, wine, sugar and zest in a glass bowl, and microwave for 2 minutes, stirring after every 30 seconds. Add grains of paradise or black pepper, mix. Whisk corn flour in water and add to the cherry mixture. Microwave for 2 minutes, stirring after every 30 seconds. Let rest for a minute and serve warm over ice cream. We had ours topped with crushed amaretti cookies (Italian almond cookies). This is my entry to Monthly Blog Patrol, an event started by Coffee. This month, Aparna of My Diverse Kitchen is guest hosting the event themed on fruits. 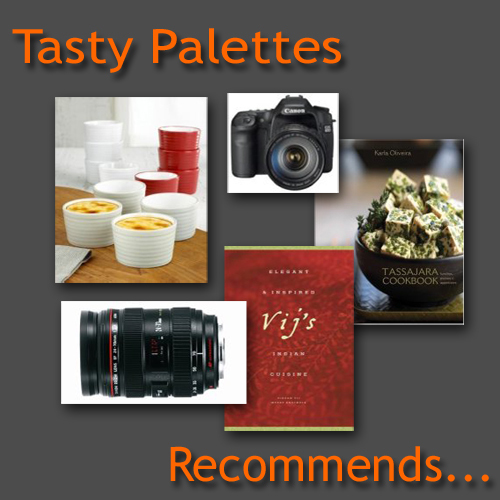 This is also my entry to Think Spice, conceived and hosted by Sunita of Sunita’s World. This popular event has turned one this month. Such an easy sauce ? I think I can try them with the plums available here in this season! What can I substitue for white wine? This sauce looks and sounds delicious. Never heard of Grains of Paradise. Thanks for participating in MBP: Fruit Fare, Suganya. Suganya, those grains of paradise sound intriguing. I have to look for those. Lovely pictures, as usual. I am drooling! Looks divine!! this is wonderful. and ur pics too looks very tempting and great. You have a great blog dear. Gorgeous looking sauce that too under four minutes! Spiced sauce on Ice cream!!!! good Idea. lovely pics!!!!! never heard of grains of paradise and i am truly intrigued. where do u get it Sug? i will see if we have any African stores around. Wow looks awesome. Sounds delicious. Love your pics! I made a cherry cobbler sometime back and absolutely loved the cherry sauce...will try the spiced version next time. I never liked any cherry flavored things but the real fruit is delightfully tasty! Wonderful post - the sauce sounds soooo good!! looks amazing, very rich! and grains of paradise? lovely name for a spice!! never tried it-will see where i can get it! like a compote - it would work for a whole range of fruit. grains of paradise sound fantastic. your photos are just amasing! Bravo! Oh, this cherry sauce would be splendid on so many different desserts. Thank you for a simply delicious recipe. It's been ages since I have had birds of paradise but I really liked them and I can imagine how good the cherries would be with them! ohhh wow...I recently played with cherry jam..and I think I have to tweak it to form a spice cherry form. Those pictures are amazing and is sounds sooo wonderful! !